Need Help! 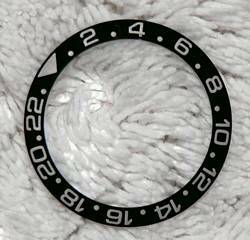 GMT IIc bezel insert came off. Thread: Need Help! 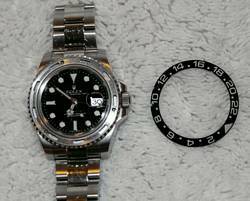 GMT IIc bezel insert came off. Good morning. I was going through airport security this morning and noticed when I picked up my watch from the bin the ceramic bezel insert was gone! Luckily, I found it on the floor where I had taken off my watch. I tried putting back on the watch but it does not want to go into the bezel. I find it odd and disappointing that this happened since the watch was not dropped or hit causing the ceramic ring to separate. I guess I need to visit an AD. Any thoughts? Thankfully, I had my trusty Glycine Lagunare LE in my briefcase. Re: Need Help! GMT IIc bezel insert came off. A little OT, but I NEVER take off my watch for airport security. It will NOT set-off the metal detector. Taking off your watch and running it through the x-ray machine is a good way to get it stolen. 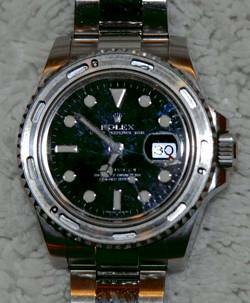 One of the guys over on the Doxa forum had his watch stolen in this same manner. just a little "my 2c worth"
Good point, Jason. I used to always take mine off until I read that account on the Doxa Forum. I've since flown a few times and my Seamaster hasn't set off an alarm yet. To the OP, I hope you can get that bezel fixed easily. B. Send your watch directly to an RSC for repair (insured USPS). 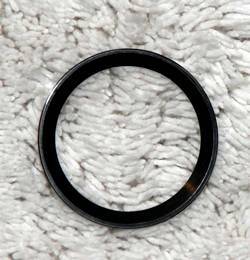 There is a good chance the AD will try to send your watch locally, and more so than likely, only RSCs have the tools required to handle ceramic bezels. A little OT, but I NEVER take off my watch for airport security. It will NOT set-off the metal detector. Here's the watch head and the ceramic bezel that fell out. Good thing g340 found it before it broke. I look forward to reading about the resolution after this watch visits the AD and the RSC. No doubt a local watchmaker can fix this insert. Sheldon/G340 thanks so much for the pictures!!! g340 reported yesterday that he dropped off his GMT-C with the New York RSC who indicated "they have seen situations like this before, but that it is uncommon." The watch will be mailed back to him. If there are "after" pictures, I will post them. Re: Here are the Images. 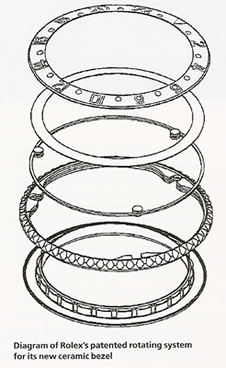 Can you tell how the bezel was retained? Is it just a press fit or do they use an adhesive of some sort? The back of the bezel looks fairly clean?